Happy Friday, and happy first day of fall!! Woohoo!! Fall here in central Texas is off to a fantastic start. Even as I sit here and write this, at almost noon, the temperature outside hasn’t even reached 75 degrees. Quite a change from our morning to night triple digit temps! And what a welcome change. It makes me giddy, and energized, and ready to tackle some projects!! Beginning this week, I’m making some changes to the weekly link party. What prompted these changes is that several of you have written to me and told me that you get more visitors from my link party than you do from link parties that are much larger than mine. And several others have mentioned that my link party is your favorite to visit. At first I was puzzled, but then I realized why this is. I know when I visit link parties that have hundreds of links, I get overwhelmed. I may quickly skim the links, and click on a couple, but that’s about it. Add to that the fact that bloggers that have these massive link parties generally use the tiniest thumbnails possible, and just forget it. Looking through hundreds of microscopic thumbnails where nothing is recognizable just isn’t fun for me. Perhaps many of you feel the same way. So I’ve decided to always keep mine small, and continue to use the big thumbnails. From here on out, the number of submissions will be limited to 75 per week. This means that as the number of submissions begins to reach the limit, I may delete some, such as repeat submissions that have already been shown here on A2D, and also multiple submissions from the same blogger, especially if one blogger submits more than three links. We’ll see how this goes for a while. Who knows where this will lead?! Perhaps a “juried” link party? That might be interesting. But we’ll see. Okay, enough yapping. Let’s get to the highlights from last week. First up, blue pumpkins? Yes, please! Learn how to achieve this crackled look at Home Stories A to Z.
I have thoroughly enjoyed watching the progress on this kitchen remodel at Domestic Imperfection, and naturally, these gorgeous butcherblock countertops caught my eye! A food feature is out of the norm for me, but potato soup is one of my absolute favorites. With fall officially being upon us, this recipe from A Fabuless Home is sure to be my new favorite. I love seeing homeowners make bold, dramatic choices in small spaces, and this striped powder room from Designed to the Nines is fantastic! Everything about this outdoor space from Tres Chere is simply perfect, from the daybed, to the fabrics, and that amazing yellow sunburst mirror. This is another out-of-the-norm type of feature for me, but this wood peg sorting and matching game from Gluesticks is too adorable to pass up. And finally, this front porch makeover from J and J Home demonstrates the power of paint. This porch went from dull to something that I would expect to see in Architectural Digest. Alright, you guys really brought your “A” game last week, and it’s time to do it all over again. Psst…come join the conversation on the A2D Facebook Page! 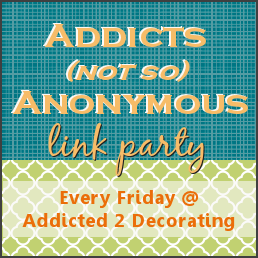 Welcome to the First Addicts (not so) Anonymous Link Party!! ooo! I like your new policy. I do get more traffic from this party than I do from a couple of the ginormous ones. You are correct when you describe the scenario of being overwhelmed by 700 thumbnails. I'm linked up. 🙂 Thanks for hosting. thanks so much for hosting the party. I do like the set up of yours. I can always see the others clearly and know others can see mine. I am so happy to hear that the temps have gone down and you can enjoy the first day of fall in true fall like fashion. It is pouring rain here 🙁 I was hoping to take a nice walk and go to the local farm to buy some pumpkins. That will have to wait. I totally agree with you about the huge link parties – I don't even know where to start and if the photos are not big – I can't see them and move on. I kinda have a juried link on my site. I add projects that I see that I love or want to do. It is like my very own Pinterest. I do like the parties that are project specific. That keeps the numbers down. I hope you enjoy your weekend and the cooler weather. I love the big thumbnails on your link party too..so much more interesting than those teeny tiny ones. Oh wow, thank you so much for your sweet comments about my front porch. You are awesome. ONLY 75?! OH MY GOSH THE PRESSURE. How stinkin' cheery is that yellow door? Love it! Thank you for hosting such a cozy party! hi Kristi, thanks so much for hosting. i love your new link party changes. i appreciate all you do. have a great weekend. Oh, love these!! You're making me more of an addict though, haha! Thanks so much for hosting, Kristi! I love your new policy…I think it's a GREAT idea…I really do get overwhelmed w/tons of links & I usually end up just not checking out more than one or two projects…so, thank you! Glad I got mine linked up…;) Have a great weekend! Hi Kristi, Not sure how I came across your site but love it! Thanks for hosting your link party. I am glad I happened to do a decor item this week to share. Nice to meet you via blog land. I like your new settings 🙂 Thanks for the great link up and have a great weekend! Hi, Kristi! So glad I was able to link up this week and made it under the 75 cut off! I agree, I really like the larger photos. Makes it so much easier to see what's what in all the links. Thanks for hosting! What a great idea to keep it to 75! I feel just like you do when I see those HUGE link parties…I tend to just close the window and move on. I wouldn't even mind 100 150 links with the big pictures, but that would be my maximum for my attention span. Ok, now off to check out the links!